Did Russia Fill Chumph Campaign Coffers? There is a report out by BuzzFeed claiming the Russian Government made at least 60 political donations in the 2016 election. Still waiting for some sort of confirmation from additional sources on this explosive claim. The split between Progressives and Democrats is growing. Money is pouring into Progressive Groups to fight the Chumph and his Republican co-conspirators. But the DNC? Not so much. The throwdown in 2018 to destroy Republican majorities in the House and Senate with Progressives instead of old line Democrats is accelerating. Hopefully, BLM has gotten a clue from this. There has never been a better time to replace some of those “Do Nothing”, Cabaret spending, black fools misrepresenting their communities on the Hill. And get some folks in with some real fire and ability to stand up for taking apart the New Jim Crow. And they’re using what could be a revolutionary technique. 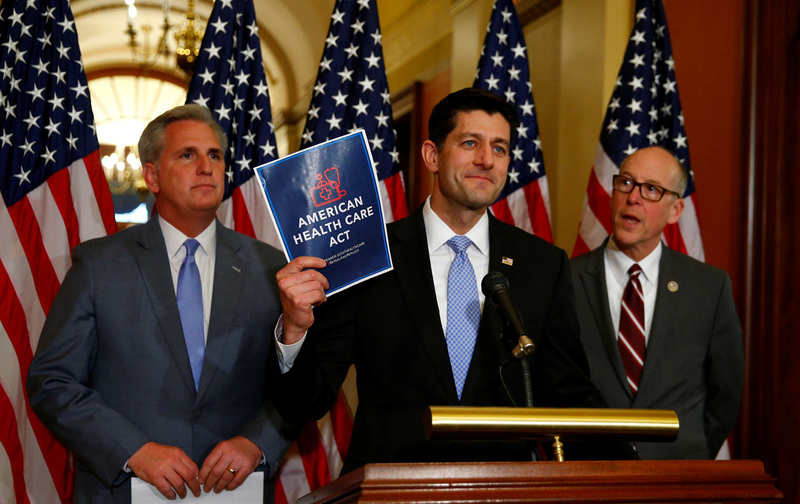 Democratic activists, revamping fundraising to support congressional candidates in the Trump era, said Friday they received a flood of grassroots donations in the 24 hours after House Republicans passed legislation to repeal huge parts of Obamacare. The progressive groups Daily Kos, ActBlue and Swing Left said they raised a total of more than $2 million from over 45,000 donors to help defeat Republicans who voted for the GOP legislation on Thursday. ActBlue, the main online fundraising hub for progressive politics and Democratic candidates, processed a total of $4.2 million ― a huge amount this far out from an election. The progressive website Daily Kos raised more than $1 million from over 22,000 donors. That money will support Democrats challenging 24 of the most vulnerable Republicans who voted for the Trumpcare bill. Swing Left, a national progressive group born in the wake of January’s Women’s March, worked with Pod Save America and the Crooked Media team to raise over $800,000 from almost 20,000 donors. Those funds will target 35 vulnerable Republicans who supported the bill. ActBlue raised over $430,000 from more than 6,000 donors to target every Republican who voted for the bill. The spontaneous flood of donations is the latest sign of increased political engagement by Democrats, shocked by their defeat in the 2016 elections. Campaigns and local Democratic parties have seen a huge jump in volunteers. Democratic candidates in special elections scattered across the country have run well ahead of normal Democratic voting percentages. But what’s interesting about the new fundraising effort is that none of the money will go to a named candidate ― yet. All of the money raised Thursday and Friday will be plowed into what are essentially escrow funds for each individual race. After the end of the respective Democratic primaries in each congressional district, the winning candidate will get access to the funds for general election efforts against their Republican opponent. ActBlue has allowed users to create these kinds of funds since 2008, but progressive groups have not used them on such a wide scale until this year. Large fundraising efforts for declared candidates normally are difficult enough ― and they’re much harder for an unnamed future candidate. That activists are willing to pour money into these accounts to fund a future candidate is a clear demonstration of their frustration and anger at Republicans and their legislative actions. “Americans are horrified that congressional Republicans just voted to take away their health care, and that’s kindled real anger—anger that the Daily Kos community is channeling with record-breaking donations at unheard-of speed,” David Nir, political director at Daily Kos, said in a statement. This fundraising model provides a way for activists to make decisions outside of the national Democratic Party. Indeed, leading Democratic Party figures have been playing catch-up with their own voters since Donald Trump won the presidency. Activists have overwhelmed local Democratic Party offices looking for volunteer opportunities. And they have heavily criticized national party organs for failing to spend money, send help or direct volunteers to special elections. The post-Trumpcare fundraising model provides a new way for activists to show their party the direction they want to go. Not the Only Clowns Who Need to Go! San Francisco 49ers Quarterback Colin Kaepernick is living up to his pledge to donate $1 million to community groups…. Two months ago, 49ers quarterback Colin Kaepernick pledged to donate $100,000 a month for the next 10 months to organizations that work toward goals consistent with his message of fighting racial inequalities. Kaepernick also promised to develop a website that would track his donations and create transparency with his charitable causes. 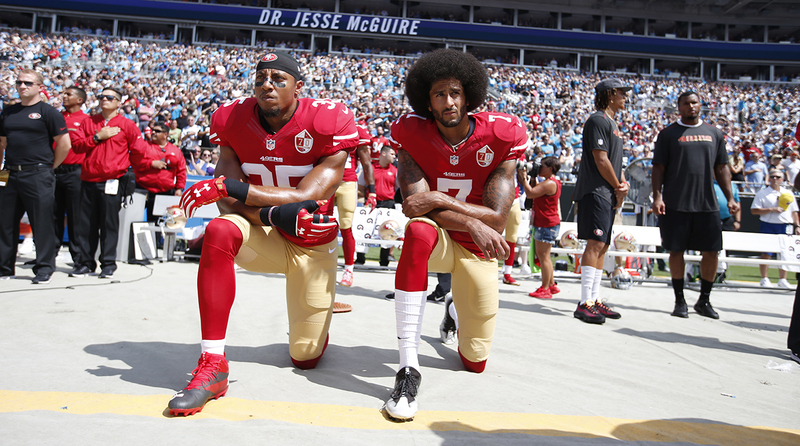 On www.Kaepernick7.com, Kaepernick reveals a total of $200,000 in pledges to organizations in San Jose, Milwaukee, Chicago, Dallas and New York for the months of October and November. “The mission of the Colin Kaepernick Foundation is to fight oppression of all kinds globally, through education and social activism,” according to the website. 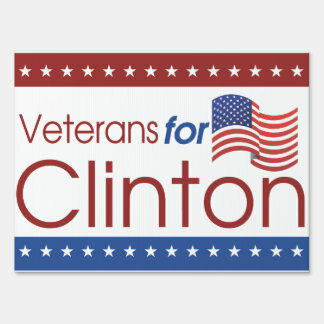 In a reversal of a long standing difference, the active Military are donating near 3 – 1 in favor of Clinton. Active and retired members of the military have been showing far more support for Democratic presidential nominee Hillary Clinton than for her Republican rival, at least as measured by the checks they’ve written to her campaign. Individuals who listed their employers as the U.S. Department of Defense or major branches of the military, or who say they’re retired from one of those, have contributed a total of $972,709 to both nominees so far this year. Clinton has claimed $771,471 of the contributions, or nearly 80 percent. All major branches of the armed forces – including the Army, Air Force, Navy, Marine Corps and Coast Guard – have favored Clinton to a much greater degree than GOP nominee Donald Trump. Members of the Army have contributed more than other branches of the service this cycle, giving a total of $191,712 to the two presidential hopefuls, 72 percent of which went to Clinton. Meanwhile, it’s the Air Force that has given the largest portion of its contributions to Trump, though it still favors Clinton by a lot. Trump received 39 percent of the $110,711 given to the two candidates by people connected to the Air Force. If this seems surprising, consider this: Up until the primaries were over, the military favorite was Sen. Bernie Sanders (D-Vt.), who received $374,600. Sen. Ted Cruz (R-Texas) came in a close third after Clinton. “People assume the military leans Republican, but I think that has fundamentally changed in the 21st century,” retired Rear Adm. Jamie Barnett said. Barnett, who has contributed $600 to Clinton campaign so far this cycle, also said that since a single person in the Oval Office can commit the country to war, those in uniform are certainly willing to put some money on the line to help elect a leader they believe has the right skill set. “The last thing we want to see is our men and women in uniform going into a war we don’t need” due to ego, lack of judgment or some other personal flaw, Barnett added. The donation numbers are in stark contrast to the Military Times poll of preferences. Retired members of the military seem particularly aghast at the thought of a Trump presidency, based on their contributions this cycle. Of the $135,392 that came from former service members so far, only 2 percent has gone to the brash businessman’s campaign. Of course, history has shown that campaign contributions don’t necessarily reflect the results at the polls. Despite Obama’s victory in contributions from the military, 2012 Gallup data showed that veterans preferred Romney by 24 points over Obama. But University of Maryland Professor Emeritus David Segal said he’s seen more veterans against Trump than for him. “Honestly, there’s not much enthusiasm for Clinton either, but veterans around me seem to have far less distaste for [Clinton] than Trump,” Segal said. “Trump does not value veterans, and in fact, insults families of veterans who have died in combat,” a reference to Trump’s tirades against the Khan family, who spoke at the Democratic National Convention in July. Daniel Petrocelli’s support for Clinton undermines Trump’s widespread claims of bias in the Trump University case. In the middle of the firestorm over Donald Trump’s racially based attacks on the judge overseeing the Trump University lawsuits, the billionaire GOP nominee went on Sean Hannity to rant against the plaintiffs’ law firm for paying Hillary Clinton large sums of money for speeches. “The whole thing is disgusting,” Trump added. But Trump’s lead lawyer in the case has Clinton ties of his own. Federal filings show that Daniel Petrocelli has donated to Clinton over the years, and even contributed $2,700 to her campaign after Trump brought him on to the politically fraught case. The fact that Trump’s own lawyer in the class-action cases has been an avid Clinton backer undermines his accusations of bias in the case, not only against the plaintiffs’ lawyers but also against U.S. District Judge Gonzalo Curiel, who Trump says has an “inherent conflict of interest” because of his Mexican heritage. Records with the Federal Election Commission show that Petrocelli has donated to several Democrats over the course of more than 15 years, including California Sen. Dianne Feinstein, Democratic presidential nominee Al Gore and, in February of 2016, to a joint fundraising committee supporting Colorado Sen. Michael Bennet.